My life of late has been lubricated by tap water, sparkling water, tonic water, juice, tea, and the occasional Coke or root beer. Much in the way I once chased the best cocktails around town, I now track down whatever can slake my thirst minus the buzz. I've tasted alcohol-free wines and beers. I've dabbled -- with some success -- in making mocktails and sipping sparkling teas. But now? I've found the world's most perfect water. I give you: Pink Grapefruit Perrier! Grapefruit is my favorite citrus fruit. It's also my favorite juice, favorite Izze, favorite Fizzy Lizzy, and favorite lip balm, so when I found grapefruit La Croix sparkling water in Minneapolis, it started a deep craving. 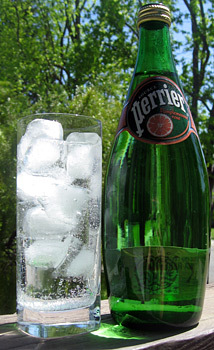 Since I found it on the official site, I knew that grapefruit Perrier existed, but I never saw it in stores. "Ooooh!" I cooed, stroking the metallic pink label, "You found it!" Is it weird to describe sparkling water as having an bouquet? Because this one totally does. Without verging into grandma's perfume territory, it's fresh and floral and not as fake smelling as the lemon or lime Perrier flavors. Ditto for the taste. The stringent grapefruit is refreshing, not at all cloying, and it's simply...Perrier perfection. It's the the ideal antidote to hauling 20 extra pounds around in 102° heat. Safeway had 750 mL bottles on sale -- 4 for $10.00 -- and after downing 6 bottles in two days during the April Hellwave of 2009, we went back and cleaned out the rest of their stock. I hope they take the hint and reorder.